Supervision and consumer protection are cornerstones of the FDIC’s efforts to maintain the stability and public confidence in, the nation’s financial system. The FDIC’s supervision program promotes the safety and soundness of FDIC-supervised IDIs, protects consumers’ rights, and promotes community investment initiatives. The FDIC’s strong bank examination program is the core of its supervisory program. As of December 31, 2012, the FDIC was the primary federal regulator for 4,472 FDIC-insured, state-chartered institutions that were not members of the Federal Reserve System (generally referred to as “state nonmember” institutions). Through risk management (safety and soundness), consumer compliance and the Community Reinvestment Act (CRA), and other specialty examinations, the FDIC assesses an institution’s operating condition, management practices and policies, and compliance with applicable laws and regulations. The FDIC also educates bankers and consumers on matters of interest and addresses consumer questions and concerns. As of December 31, 2012, the FDIC conducted 2,563 statutorily required risk management (safety and soundness) examinations, including a review of Bank Secrecy Act (BSA) compliance, and all required follow-up examinations for FDIC-supervised problem institutions, within prescribed time frames. The FDIC also conducted 1,665 statutorily required CRA/compliance examinations (1,044 joint CRA/compliance examinations, 611 compliance-only examinations, and 10 CRA-only examinations) and 5,673 specialty examinations. As of December 31, 2012, all CRA/compliance examinations were conducted within the time frame established by policy. The table on this page compares the number of examinations, by type, conducted from 2010 through 2012. As of December 31, 2012, there were 651 insured institutions with total assets of $232.7 billion designated as problem institutions for safety and soundness purposes (defined as those institutions having a composite CAMELS2 rating of “4” or “5”), compared to the 813 problem institutions with total assets of $319.4 billion on December 31, 2011. This constituted a 20 percent decline in the number of problem institutions and a 27 percent decrease in problem institution assets. In 2012, 256 institutions with aggregate assets of $94.1 billion were removed from the list of problem financial institutions, while 94 institutions with aggregate assets of $34.3 billion were added to the list. Tennessee Commerce Bank, located in Franklin, Tennessee, was the largest failure in 2012, with $1.0 billion in assets. The FDIC is the primary federal regulator for 433 of the 651 problem institutions, with total assets of $138.7 billion. During 2012, the FDIC issued the following formal and informal corrective actions to address safety and soundness concerns: 104 Consent Orders and 224 Memoranda of Understanding (MOUs). Of these actions, 19 Consent Orders and 15 MOUs were issued, based in whole or in part, on apparent violations of the BSA. As of December 31, 2012, 29 insured state nonmember institutions, about 1 percent of all supervised institutions, having total assets of $54.0 billion were rated “4” or “5” for consumer compliance purposes. As of December 31, 2012, all follow-up examinations for problem institutions were performed on schedule. Overall, banks demonstrated strong consumer compliance programs. The most significant consumer protection issue that emerged from the 2012 compliance examinations involved banks’ failure to adequately monitor third-party vendors. As a result, we found violations involving unfair or deceptive acts or practices, resulting in consumer restitution and civil money penalties. The violations involved a variety of issues including failure to disclose material information about new products being offered, deceptive marketing and sales practices, and misrepresentations about the costs of products. During 2012, the FDIC issued the following formal and informal corrective actions to address compliance concerns: 23 Consent Orders, 92 MOUs, and 109 Civil Money Penalties (CMPs). In certain cases, the Consent Orders issued by the FDIC contain requirements for institutions to pay restitution in the form of refunds to consumers for different violations of laws. During 2012, over $294 million was refunded to consumers by institutions subject to Consent Orders. These refunds primarily related to unfair or deceptive practices by institutions, mainly related to different credit card programs, as discussed above. In the case of CMPs, institutions pay penalties to the U.S. Treasury. Approximately 85 percent of the CMPs involved repeated errors in the submission of required data under the Home Mortgage Disclosure Act (HMDA) or statutorily mandated penalties for violations of the regulations entitled Loans in Areas Having Special Flood Hazards. The average CMP for HMDA and Flood Insurance violations was $8,700. The FDIC pursued a number of BSA, Anti-Money Laundering (AML), and Counter-Terrorist Financing (CTF) initiatives in 2012. The FDIC conducted a Basic International AML and CTF training session in May 2012, for 22 financial sector supervisors and regulatory staff from Bangladesh, Djibouti, Ethiopia, India, and Niger. Also, two Advanced International AML and CTF training sessions were held in October and December 2012 for 47 participants from Bahrain, Indonesia, Kuwait, Malaysia, Oman, Qatar, Philippines, Thailand, and Yemen. The training focused on AML/CTF controls, the AML examination process, customer due diligence, suspicious activity monitoring, and foreign correspondent banking. The session also included presentations from the Federal Bureau of Investigation, the Financial Crimes Enforcement Network (FinCEN), and the Department of Homeland Security. Topics addressed by invited speakers included combating terrorist financing, trade-based money laundering, bulk cash smuggling and related investigations, law enforcement’s use of BSA reporting by financial institutions, and the role of financial intelligence units in detecting and investigating illegal activities. The basic training session concentrated on core areas of AML risk (e.g., customer due diligence, suspicious activity reporting, private banking, wire transfers, and foreign correspondent banking), while the advanced class focused more on effective implementation of AML examination processes, such as expectations for enhanced due diligence. The preservation of Minority Depository Institutions (MDIs) remains a high priority for the FDIC. In 2012, the FDIC appointed a dedicated permanent executive to lead the National Minority Depository Institution and Community Development Financial Institution programs. The FDIC is developing a more comprehensive approach to preserving the number of minority financial institutions, preserving the minority character in cases of merger or acquisition, and promoting and encouraging the creation of new MDIs. The FDIC continued to offer the benefit of having an examiner or a member of regional office management return to FDIC-supervised MDIs from 90 to 120 days after an examination, to help management understand and implement examination recommendations, or to discuss other issues of interest. Several MDIs took advantage of this initiative in 2012. Also, the FDIC regional offices held outreach training efforts and educational programs for MDIs through conference calls and banker roundtables with MDIs in the geographic regions. Topics of discussion for these sessions included both compliance and risk management, and additional discussions included the economy, overall banking conditions, proposed Basel III capital rules, asset disposition, accounting, and other bank examination issues. In June 2012, the FDIC and the federal banking agencies published a final rule that revises the risk-based capital treatment for trading assets and liabilities for certain banking organizations. This final rule applies to a banking organization with aggregate trading assets and liabilities equal to 10 percent of total assets, or $1 billion or more. Additionally, the final rule includes alternative standards of creditworthiness for the use of credit ratings consistent with Section 939A of the Dodd-Frank Act. The final rule became effective on January 1, 2013. Basel III NPR – published consistent with agreements reached by the Basel Committee on Banking Supervision (BCBS), would apply to all insured banks and savings associations, top-tier bank holding companies domiciled in the United States with more than $500 million in assets, and savings and loan holding companies that are domiciled in the United States. The NPR would implement a new common equity tier 1 minimum capital requirement, a higher minimum tier 1 risk-based capital requirement, and, for banking organizations subject to the advanced approaches capital rules, a supplementary leverage ratio that incorporates a broader set of exposures. Additionally, the Basel III NPR would apply limits on a banking organization’s capital distributions and certain discretionary bonus payments if the banking organization does not hold a specified “buffer” of common equity tier 1 capital, in addition to the minimum risk-based capital requirements. Lastly, the NPR would revise the federal banking agencies’ prompt corrective action framework by incorporating the new regulatory capital minimums. Advanced Approaches NPR – would revise the advanced approaches risk-based capital rules consistent with Basel III and other changes to the Basel Committee’s capital standards. The NPR also revised the advanced approaches risk-based capital rules to be consistent with Section 939A and Section 171 of the Dodd-Frank Act. Additionally in this NPR, the Office of the Comptroller of the Currency (OCC) and the FDIC propose that the market risk capital rules apply to federal and state savings associations, and the Board of Governors of the Federal Reserve System proposes that the advanced approaches and market risk capital rules apply to top-tier savings and loan holding companies domiciled in the United States, if stated thresholds for trading activity are met. Generally, the advanced approaches rules would apply to such institutions with $250 billion or more in consolidated assets or $10 billion or more in foreign exposure, and the market risk rule would apply to savings and loan holding companies with significant trading activity. Standardized Approach NPR – would revise and harmonize rules for calculating risk-weighted assets to enhance risk sensitivity and address weaknesses identified over recent years. The NPR also proposes alternatives to credit ratings consistent with section 939A of the Dodd-Frank Act. The revisions include methods for determining risk-weighted assets for residential mortgages, securitization exposures, and counterparty credit risk. The NPR also would introduce disclosure requirements that would apply to U.S. banking organizations with $50 billion or more in total assets. The Standardized Approach NPR would apply to the same set of institutions as the Basel III NPR. The agencies extended the comment period from September 7, 2012, to October 22, 2012, to allow interested parties more time to review and evaluate the proposals, and prepare written comments. The agencies received over 2,300 comment letters. The majority of the comment letters addressed the Basel III and Standardized Approach NPRs, and most were submitted by community banks. Final rulemaking on the capital NPRs is expected in 2013. In June 2011, the FDIC along with the other federal banking agencies, issued proposed guidance on stress testing by banking organizations with more than $10 billion in total consolidated assets. After consideration of comments received, the FDIC issued a final rule in October 2012 that implements requirements of Section 165(i) of the Dodd-Frank Act. The rule reinforces the need to establish an effective stress testing framework as an ongoing risk management practice that supports a banking organization’s forward-looking assessment of its risks. The rule delayed the implementation of the annual stress requirements for institutions with total consolidated assets between $10 and $50 billion until September 30, 2013, to ensure these institutions have sufficient time to develop high-quality stress testing programs. The FDIC reserved the authority to allow covered institutions above $50 billion to delay implementation of the rule on a case-by-case basis. In May 2012, the FDIC, jointly with the other federal banking regulators, issued a public statement to clarify that stress testing expectations applicable to large banking organizations do not apply to institutions with $10 billion or less in total assets. Instead, the agencies noted that community banks are subject to the stress testing expectations contained in existing guidance covering interest rate risk management, commercial real estate concentrations, and funding and liquidity management. The Dodd Frank Act required and the Corporation’s 2012 Annual Performance Plan established goals for the completion of rules and/or policy guidance on five topics that were not successfully completed during 2012: proprietary trading and other investment restrictions (the “Volcker Rule”); restrictions on Federal assistance to swaps entities; capital, margin, and other requirements for OTC derivatives; credit risk retention requirements for securitizations; and enhanced compensation structure and incentive compensation requirements. The bank regulatory agencies and other financial regulatory agencies were tasked to issue these rules and policy guidance on an interagency basis. They worked diligently throughout the year to complete final rules on each of these topics and made considerable progress. In each case, NPRs have been issued (one in 2011), and extensive comments were received. Working groups have been carefully reviewing the comments received. Completion of final rules was delayed, however, by the complex issues raised in the comments and the agencies’ desire to give careful and thorough consideration to those comments. The agencies hope to issue final rules on all or most of these topics in 2013. More detail is provided below on the OTC Derivatives and Volcker Rule NPRs. In April 2011, the FDIC, along with the other federal banking agencies, the Farm Credit Administration, and the Federal Housing Finance Agency (FHFA), published a proposed rule to enhance the stability of the financial system by preventing certain large financial firms from entering into uncollateralized derivatives exposure with each other. This proposed rule would implement certain requirements contained in Sections 731 and Section 764 of the Dodd-Frank Act, which direct the federal banking agencies to jointly adopt rules requiring dealers and major participants in derivatives covered by Title VII to collect both initial and variation margin. In October 2012, the agencies reopened the comment period for the proposed rule to allow interested parties additional time to analyze and comment on the proposed margin rule, in light of the consultative document on margin requirements for non-centrally-cleared derivatives, recently published for comment by the BCBS, and the International Organization of Securities Commissions. The comment period closed on November 26, 2012. Final rulemaking is expected in 2013. On November 7, 2011, the FDIC, along with the other federal banking agencies, and the Securities and Exchange Commission, published a joint NPR to implement the provisions of Section 619 of the Dodd-Frank Act, which restricts the ability of banking entities to engage in proprietary trading, and limits investments in hedge funds and private equity funds. In January 2012, the agencies extended the comment period until February 13, 2012, due to the complexity of the issues involved and to facilitate coordination of the rulemaking. The agencies received approximately 300 substantive comment letters, with approximately 16,400 form comment letters in response to the NPR. In April 2012, the agencies issued guidance on the statutory conformance period that will extend through July 21, 2014. Final rulemaking is expected in 2013. In July 2012, the FDIC issued a final rule that prohibits any insured savings associations from acquiring or retaining a corporate debt security, when the security’s issuer does not have adequate capacity to meet all financial commitments under the security for the security’s projected life. The final rule was issued to comply with Section 939A of the Dodd-Frank Act. Insured savings associations must comply with the rule by January 1, 2013. The rule was accompanied by guidance that sets forth due diligence standards for determining the credit quality of a corporate debt security. In November 2012, the FDIC issued a Financial Institution Letter (FIL) to remind FDIC-supervised institutions of recent regulatory changes regarding the permissibility of certain investment activities. Under FDIC regulations, insured state banks generally are prohibited from engaging in an investment activity that is not permissible for a national bank under OCC regulations, including the requirements of the OCC final rule titled, Alternatives to the Use of External Credit Ratings in the Regulations of the OCC. The FDIC’s rule on corporate debt securities investments by federal and state savings associations is consistent with the OCC’s final rule and related guidance on due diligence considerations and creditworthiness standards for investment securities. In June 2012, the FDIC issued interagency guidance jointly with the Consumer Financial Protection Bureau (CFPB), the Board of Governors of the Federal Reserve System, the OCC, and the National Credit Union Administration (NCUA) to address unique circumstances involving some military homeowners who received Permanent Change of Station (PCS) orders. The guidance highlights concerns about practices that have the potential to mislead or otherwise cause harm to homeowners with PCS orders, and reminds mortgage servicers to ensure that appropriate risk management policies, procedures, and training are in place. In July 2012, the FDIC issued an FIL addressing complaints received that certain IDIs are charging customers an “FDIC fee” or similarly described fee for deposit insurance. The FIL discourages institutions from specifically designating that a customer’s fee is for deposit insurance, or from stating or implying that the FDIC is charging such a fee, due to the potential to reveal information that could be used to determine an IDI’s confidential supervisory ratings, mislead customers into believing that the FDIC charges IDI customers or requires IDIs to charges customers, or both. In August 2012, the FDIC published examination procedures for reviewing an institution’s compliance with the Secure and Fair Enforcement for Mortgage Licensing Act (SAFE Act) and regulations. The SAFE Act was enacted on July 30, 2008, and mandated a nationwide licensing and registration system for mortgage loan originators (MLOs). The procedures focus on the federal residential MLO registration requirements, and an institution’s obligation to implement appropriate policies and procedures, and conduct annual independent compliance testing. During 2012, the FDIC issued and participated in the issuance of other rulemaking and guidance in several areas as described below. On August 15, 2012, the FDIC jointly with the Board of Governors of the Federal Reserve System, CFPB, FHFA, NCUA, and the OCC, issued an NPR to implement the appraisal requirements for higher-risk mortgages as stated in Section 1471 of the Dodd-Frank Act. Section 1471 adds a new Section 129H to the Truth in Lending Act. For residential mortgage loans secured by the consumer’s principal dwelling, with an annual percentage rate that exceeds the average prime offer rate by a specified percentage, the proposed rule would require creditors to (1) obtain an appraisal or appraisals meeting certain specified standards, (2) provide applicants with a notification regarding the use of the appraisals, and (3) give applicants a copy of the written appraisals used. The comment period closed on October 15, 2012, and the agencies worked to finalize the rule. On November 26, 2012, the FDIC and the other federal and state banking agencies issued guidance to clarify supervisory expectations for regulatory conversion subject to Section 612 of the Dodd-Frank Act. This section prohibits charter conversions by certain institutions that are subject to a formal corrective program or an MOU with respect to a significant supervisory matter. Institutions may request an exception to the conversion prohibition as described in the statute. The agencies expect that exceptions will be rare and generally would occur only when an enforcement action’s provisions have been substantially addressed. During 2012, the FDIC issued nine FILs that provide guidance to help financial institutions and facilitate recovery in areas damaged by hurricanes, wildfires, tornadoes, flooding, and other natural disasters. In these FILs, the FDIC encouraged banks to work constructively with borrowers experiencing financial difficulties as a result of natural disasters, and clarified that prudent extensions or modifications of loan terms in such circumstances can contribute to the health of communities and serve the long-term interests of lending institutions. In addition, the FDIC jointly with the other federal banking agencies, issued a Statement on Supervisory Practices Regarding Financial Institutions and Borrowers Affected by Hurricane Sandy to provide regulatory assistance to affected financial institutions. On October 16, 2012, the FDIC, through the auspices of the Federal Financial Institutions Examination Council (FFIEC) issued a statement encouraging financial institutions to work with agricultural customers impacted by the significant drought conditions affecting the Midwest and southern states. The statement encourages banks to continue making credit available to agricultural borrowers and to provide prudent loan modifications when appropriate. On March 26, 2012, the FDIC and the other federal banking agencies proposed revisions to the 2001 interagency guidance on leveraged financing. The proposal’s purpose is to update the existing guidance and clarify regulatory expectations in light of significant growth in the leveraged lending market, and incorporate lessons learned from the recent financial crisis. The proposal describes expectations for the sound risk management of leveraged lending activities, including well-defined underwriting standards, effective management information systems, a prudent credit limit and concentration framework, and strong pipeline management policies. The banking agencies are considering revisions to the proposal based on the 16 public comments that were received by the June 8, 2012, due date. In 2012, the FDIC hosted a series of banker teleconferences to maintain open lines of communication and update supervised institutions about compliance and consumer protection related rulemakings, guidance, and emerging issues. Participants included bank directors, officers, staff, and other banking industry professionals. Five teleconferences were held in 2012. The topics discussed included: Regulations Z’s Mortgage Loan Originator Compensation Rule, Third-Party Compliance Risk Management, Significant Mortgage-Related Proposed Regulations (which were the subject of two calls), and Fair Lending. The Advisory Committee on Economic Inclusion (ComE-IN) was originally established by former Chairman Sheila C. Bair and the FDIC Board of Directors pursuant to the Federal Advisory Committee Act in November 2006. The ComEIN provides the FDIC with advice and recommendations on important initiatives focused on expanding access to banking services by underserved populations. This may include reviewing basic retail financial services such as check cashing, money orders, remittances, stored value cards, short-term loans, savings accounts, and other services that promote asset accumulation by individuals and financial stability. During 2012, the Committee met on three occasions and discussed the FDIC’s research initiatives on the Banks’ Efforts to Serve the Unbanked and Underbanked, the FDIC’s National Survey of Unbanked and Underbanked Households, mobile financial services, model SAFE accounts, and prepaid card products. Section 7 of the Federal Deposit Insurance Reform Conforming Amendments Act of 2005 (Reform Act) mandates that the FDIC survey IDIs every two years to assess their efforts to bring individuals and families into the conventional finance system. In 2011, the FDIC conducted its second nationwide survey of FDIC-IDIs to assess efforts to serve unbanked and underbanked individuals and families. The 2011 survey focused on banks’ basic transaction and savings account programs, auxiliary product and service offerings, and financial education and outreach efforts. Analysis of the survey results was completed in 2012, and the final results were released to the public in December 2012. The findings from the report, 2011 FDIC Survey of Banks’ Efforts to Serve Unbanked and Underbanked, informs financial institutions, community organizations, and other stakeholders interested in expanding financial products and services, to unbanked and underbanked consumers. The goal of the FDIC’s Alliance for Economic Inclusion (AEI) initiative is to collaborate with financial institutions; community organizations; local, state, and federal agencies; and other partners in select markets to launch broad-based coalitions to bring unbanked and underbanked consumers into the financial mainstream. During 2012, the FDIC expanded the geographic reach of the AEI program. Initially in 14 markets, the FDIC launched AEI initiatives in two additional markets: the Appalachian region of West Virginia and Northeastern Oklahoma. The West Virginia effort resulted in 30 organizations joining the AEI as of year-end; and the Northeastern Oklahoma effort resulted in participation from 49 representatives from 33 organizations. More than 110 banks and organizations joined AEI nationwide, bringing the total number of AEI members to 1,360. At least 133,578 consumers opened a bank account as a result of AEI efforts. Combined, more than 536,000 bank accounts have been opened through the AEI program. Approximately 116,413 consumers received financial education through the AEI, bringing the total number of consumers educated to 380,000. The FDIC also provided program guidance and technical assistance in the expansion of 70 Bank On programs. Bank On initiatives are designed to reduce barriers to banking and increase access to the financial mainstream. The FDIC expanded its financial education efforts during 2012 through a strategy that included providing access to timely and high-quality financial education products, sharing best practices, and working through partnerships to reach consumers. The FDIC joined with the Small Business Administration (SBA) on April 24, 2012, to launch the new Money Smart for Small Business curriculum. The ten modules in this instructor-led curriculum provide introductory training for new and aspiring entrepreneurs on the basics of organizing and managing a business. Money Smart for Small Business is a tool for bank-community partnerships. The curriculum is intended to be delivered by stakeholders experienced with small business lending or development. Since the release of the curriculum, more than 10,000 copies have been distributed, and 11 partnerships were developed with organizations that can use or otherwise promote the curriculum to key stakeholders. Money Smart Computer-Based Instruction (CBI) offers key elements of the eight modules of the instructor-led Money Smart for Young Adults curriculum and eleven modules of the instructor-led Money Smart for Adults curriculum. The CBI features an interactive game-based design. Approximately 29,000 users accessed the CBI during the eight months from its release date through year-end. Money Smart for Elementary School Students is designed to introduce key personal finance concepts to children ages 5 to 8. Since its release in May 2012, more than 35,000 copies have been downloaded. Through training and technical assistance, the FDIC emphasizes the importance of pairing education with access to appropriate banking products and services. During 2012, more than 1,300 practitioners attended the 52 train-the-trainer sessions. Approximately 1,200 organizations are members of the Money Smart Alliance, and the FDIC worked with many other organizations to promote financial education, such as the Corporate Adopt a School program, which has reached approximately 2,492 students at underserved schools with financial education training. In 2012, the FDIC undertook over 662 community development, technical assistance, and outreach activities and events designed to facilitate understanding and connection between financial institutions and other community stakeholders. The FDIC collaborated with the OCC, Federal Reserve Banks, and other stakeholders to conduct 57 CRA roundtables to provide market-specific training for bankers on enhancing CRA performance, thereby building the capacity of financial institutions to more effectively meet community and small business development needs. The FDIC also conducted 21 workshops for nonprofit stakeholders on effectively engaging with financial institutions to promote community development. 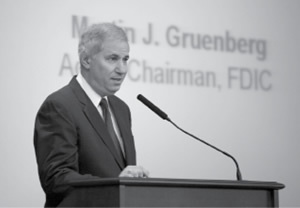 FDIC then-Acting Chairman Martin J. Gruenberg opens the Future of Community Banking Conference on February 16, in Arlington, Virginia. Future of Community Banking Conference – On February 16, 2012, the FDIC held a community banking conference that brought together community bankers, regulators, academics, and various community bank stakeholders to examine the unique role community banks perform in our nation’s economy and the challenges and opportunities they face. Then-Acting FDIC Chairman Gruenberg opened and closed the conference, which also featured keynote remarks by Shelley Moore Capito, U.S. Congresswoman for West Virginia’s 2nd District; Ben S. Bernanke, Chairman, Board of Governors of the Federal Reserve System; and Thomas J. Curry, Director, FDIC. The conference explored the evolution and characteristics of community banks, current challenges and opportunities for community banks, perspectives of community bank customers, and lessons learned and successful strategies for the community bank of the future. Community Bank Roundtable Discussions – From March to October of 2012, the FDIC conducted roundtable discussions in each of the six FDIC regions with about 70 to 100 attendees, including community bankers, state banking commissioners, state bank trade association representatives, the FDIC’s senior executives for supervision, and two members of the FDIC’s Board of Directors (including the FDIC’s then-Acting Chairman). Each meeting addressed financial and operational challenges and opportunities facing community banks and the regulatory interaction process. The insights provided during the discussions added to other components of the community banking initiatives. Community Banking Study – On December 17, 2012, the FDIC released a study of community banking in the United States. The goal of this study was to analyze and document what has happened to community banks since 1985. The study set out to explore some basic research questions about community banks, including trends in consolidation, overall financial performance, geographic footprint, business model variations, efficiency and economies of scale, and access to capital. The FDIC assembled a comprehensive database using detailed financial data from bank Call Reports and Thrift Financial Reports, standardizing the data to conduct analysis across the industry beginning in 1984. Financial data have also been linked to the Summary of Deposits data (and Branch Office Survey data for thrifts) that provide a detailed record of banking office location and deposit gathering trends dating back to 1987. The result is an assembly of the most complete record of the history of the financial performance and structural change in the banking industry over the past two and a half decades. This data-driven approach results in a foundational study that provides a platform for future analysis by the FDIC and other researchers with an interest in community banking. Targeted Community Banking Research – The FDIC continues to conduct specialized studies and research to more deeply explore certain issues and questions about community banks. On December 18, 2012, the FDIC released two targeted research papers: “Community Bank Efficiency and Economies of Scale” and “What Factors Explain Differences in Return on Assets Among Community Banks?” These papers delve deeper in explaining community bank performance, based on efficiency ratio trends and other bank-specific factors. Review of Examination and Rulemaking Processes – In 2012, the FDIC reviewed the processes for examining community banks and releasing rulemakings and guidance. The FDIC solicited input from community bankers and incorporated that feedback into various improvements. Also, the FDIC’s extensive communication and technical support efforts for community bankers included an educational outreach effort to explain key technical points of the proposed capital rules that included six regional banker meetings, a national teleconference call, educational material posted to the FDIC’s website, and an online tool to help bankers measure the potential impact of the proposed capital rules. Members of the FDIC Advisory Committee on Community Banking. In addition, the FDIC’s Community Bank Advisory Committee continued to provide timely information and input to the FDIC on a variety of community bank policy and operational issues throughout 2012. The Committee held three meetings in 2012 and provided input on a number of key issues and initiatives, including the FDIC’s community bank study and research project, proposed improvements to the FDIC’s regulatory and supervisory processes, the status of the Transaction Account Guarantee Program (TAG), the FDIC’s preliminary plan to review its regulations under the Economic Growth and Regulatory Paperwork Reduction Act, as well as the potential effects of various regulatory and legislative developments on community banks. Looking forward, the FDIC will continue to make the Community Banking Initiative a high priority by following up on the Community Banking Study, pursuing additional research relating to the continued viability of community banks, and continuing our review of examination and rulemaking processes with the goal of identifying additional ways to make the supervisory process more efficient, consistent, and transparent, consistent with safe and sound banking practices. The Center for Financial Research (CFR) was founded by the Corporation in 2004 to encourage and support innovative research on topics that are important to the FDIC’s role as deposit insurer and bank supervisor. During 2012, the CFR co-sponsored two major research conferences. The CFR organized and sponsored the 22nd Annual Derivatives Securities and Risk Management Conference jointly with Cornell University’s Johnson Graduate School of Management and the University of Houston’s Bauer College of Business. The conference was held in March 2012 at the Seidman Center and attracted over 100 researchers from around the world. Conference presentations included systemic risk, asset price dynamics, asset pricing, and credit spreads. The CFR also organized and sponsored the 12th Annual Bank Research Conference jointly with the Journal for Financial Services Research (JFSR), in September 2012. The conference theme, “Performance of Financial Services in the Current Environment,” focused on the financial services industry and included over 20 presentations attended by over 120 participants. Experts discussed a range of topics including systemic risk and bank lending, liquidity, and capital issues. In addition to conferences, workshops and symposia, three CFR working papers were completed and made public on topics including bank bailouts, executive compensation, and tightening loan contracts. Issued an updated FFIEC Technology Service Provider booklet. This booklet replaces the March 2003 version. Published the Federal Regulatory Agencies’ Administrative Guidelines: Implementation of the Interagency Programs for the Supervision of Technology Service Providers. Published a Supervisory Insights Journal article on mobile payments. Issued revised guidance describing potential risks associated with relationships with third-party entities that process payments for telemarketers, online businesses, and other merchants. Hosted the FFIEC IT Conference that addressed technology and operational issues facing the financial federal regulatory agencies. Assisted financial institutions in identifying and shutting down “phishing” websites. The term “phishing”—as in “fishing” for confidential information—refers to scams to fraudulently obtain and use an individual’s personal or financial information. Issued six Consumer Alerts pertaining to emails and telephone calls fraudulently claiming to be from the FDIC. The FDIC conducts IT and operations examinations of financial institutions and technology service providers (TSP). These examinations ensure that institutions and TSPs have implemented adequate risk management practices for the confidentiality, integrity, and availability of sensitive, material, and critical information assets. The result of an IT examination is a FFIEC Uniform Rating System for Information Technology rating. In 2012, the FDIC conducted 2,642 IT and operations examinations at financial institutions and TSPs. Further, as part of its ongoing supervision process, the FDIC monitors significant events, such as data breaches and natural disasters that may affect financial institution operations or customers. The FDIC investigates consumer complaints concerning FDIC-supervised institutions and answers inquiries from the public about consumer protection laws and banking practices. As of December 31, 2012, the FDIC received 10,564 written complaints, of which 5,088 involved complaints against state nonmember institutions. The FDIC responded to over 98 percent of these complaints within time frames established by corporate policy, and acknowledged 100 percent of all consumer complaints and inquiries within 14 days. The FDIC also responded to 1,793 written inquiries, of which 403 involved state nonmember institutions. In addition, the FDIC responded to 5,209 telephone calls from the public and members of the banking community, of which 2,721 concerned state nonmember institutions. In 2012 the prudential regulators and the Consumer Financial Protection Bureau (CFPB) signed an MOU to coordinate supervisory matters for institutions with assets over $10 billion and their affiliates. The CFPB was charged with developing regulations to implement the mortgage reforms and other aspects of regulatory reform in the Dodd-Frank Act. As required by the statute, the FDIC coordinated with the CFPB on the regulations for which it is solely responsible. The FDIC also worked with the CFPB and other banking agencies to develop and implement joint regulations. As of December 31, 2012, the FDIC received 1,369 complaints involving FDIC-supervised banks under the jurisdiction of the CFPB. Under the agreement between the FDIC and the CFPB, the FDIC investigated 497 of the 1,369 complaints and referred the remaining 872 to the CFPB. The FDIC provides a significant amount of education for consumers and the banking industry on the rules for deposit insurance coverage. An important part of the FDIC’s deposit insurance mission is ensuring that bankers and consumers have access to accurate information about the FDIC’s rules for deposit insurance coverage. The FDIC has an extensive deposit insurance education program consisting of seminars for bankers, electronic tools for estimating deposit insurance coverage, and written and electronic information targeted to both bankers and consumers. The FDIC continued its efforts to educate bankers and consumers about the rules and requirements for FDIC insurance coverage. During 2012, the FDIC conducted 15 telephone seminars for bankers on deposit insurance coverage, reaching an estimated 27,734 bankers participating at approximately 7,924 bank locations throughout the country. The FDIC also updated its deposit insurance coverage publications and educational tools for consumers and bankers, including brochures, resource guides, videos, and the Electronic Deposit Insurance Estimator (EDIE). In 2012, the FDIC received and answered approximately 97,453 telephone deposit insurance-related inquiries from consumers and bankers. The FDIC Call Center addressed 50,845 of these inquiries, and deposit insurance coverage subject-matter experts handled the other 46,608. In addition to telephone inquiries about deposit insurance coverage, the FDIC received 2,619 written inquiries from consumers and bankers. Of these inquiries, 99 percent received responses within two weeks, as required by corporate policy. 2 The Act also requires that the FDIC offset the effect on institutions with less than $10 billion in assets of increasing the reserve ratio from 1.15 percent to 1.35 percent. The FDIC will promulgate a rulemaking that implements this requirement at a later date to better take into account prevailing industry conditions at the time of the offset.